Forbes estimated in 2012 that the U.S. economy lost over 500 billion dollars from employee sickness. Poor physical health days represent a huge loss to the business community and impact job marketability for individual workers. Those who experience chronic illness often have difficulties maintaining consistent employment and affording care, resulting in a negative feedback loop that keeps them from having the resources they need to manage their health. The poor physical health days measure is the average number of days in the past month that adults have reported experiencing less than good physical health. 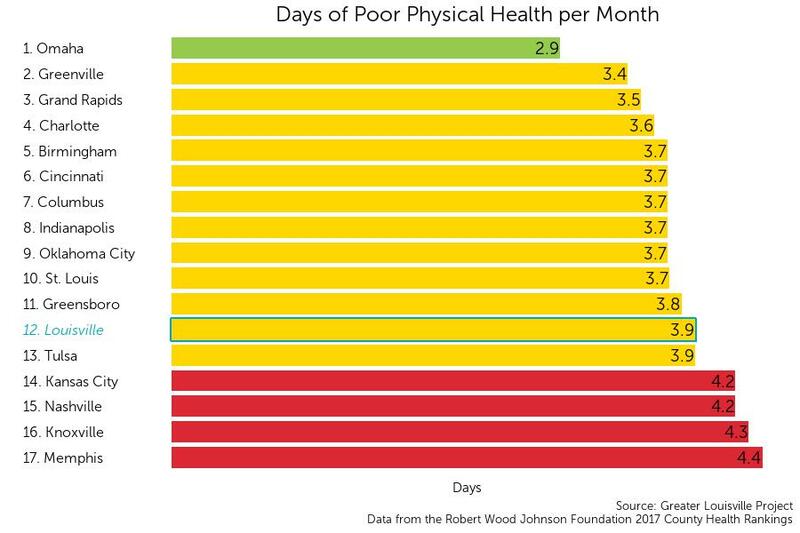 Louisville currently ranks 12th among its peer cities with an average of 3.9 days per month of poor physical health per month.